Econ will present its optimized underwater pelletizing system with integrated band filter in Fakuma 2012. It is directly incorporated in the process water circulation and enables full filtration of the whole water stream, immediately after initial drainage of the pellets. The company says this system is developed especially for processing highly filled compounds or for masterbatch applications as in these areas efficient filtration of the process water is inevitable. The compact band filter system is built up of a semicircular filtration tank, which is sidewise sealed with filter wheels for the revolving transport of the fleece. Sideways, the contaminated process water runs over a quill shaft in the filtration tank and soaks the filter fleece. The water runs down into a buffer tank, from where the process water pump conveys the clean water back to the pelletizer. Contaminants and fines are held back by the fleece and form some kind of mud cake, which causes a rise of the water level. Used fleece and the mud cake are automatically forwarded out of the filtration tank and are conveyed to a collecting tray. Simultaneously new fleece is inserted. Via the sidewise sealing within the filter fleece, the filter wheels and the filter transport band no contaminated water can reach the tank below to obtain 100% filtration performance. By applying filter fleece of diverse qualities cleaning results can be adjusted to individual requirements. Also simple handling of the band filter is given, as the fleece can be changed while operating the machine. With only a few steps the fleece roll can be exchanged, adds Econ. 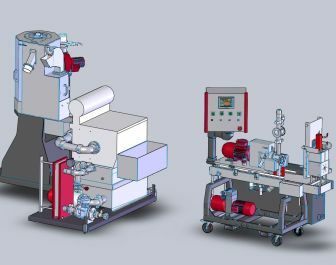 The company offers this new band filter system in connection with their centrifugal dryer, as well as with their vibration drying system. According to Econ, the first customer applications proof the efficiency of this new filter system. Maintenance and cleaning efforts are reduced significantly and availability and flexibility of the machinery are considerably increased.